What’s in a name? Well, since you asked we’ll tell you! Mr. Dana Lowe, Rockvale native and historian, shared some interesting information and stories about the community. He explained that a named community exists every few miles in the county and residents feel a certain loyalty to “their” town. Here’s a snapshot of Rockvale and her sister cities in the late 1960’s quoted from a speech Dana and friend Ron Burns gave at Middle Tennessee State University. Rockvale Review thanks Dana for this glimpse into Rockvale history. 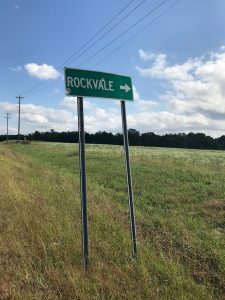 Rockvale is an unincorporated community in Rutherford County, Tennessee, and has a population of around 6000 people. Rolling green hills and farmland, consistent with the landscape of middle Tennessee, make this community a beautiful and quiet place to live. But underneath the vale of green is a rocky structure of biological importance. Snail Shell Cave in Rockvale is a large cave that is owned and managed by the Southeastern Cave Conservancy. The cave system drains over 100 square miles of land and the water re-emerges at a major spring on the Stones River. What better metaphor can you find for a poetry journal than this? Solidity and structure that collects life-giving water, spreading it with the flow and force of a river as it supplies a community with nourishment. A solid strong base. A fertile landscape. Sharp, precise structure combined with fluid, beautiful imagery. Bold language that is not afraid to be vulnerable too.